The Big Lobster in Kingston is one of Australia’s tourist icons and something you don’t want to miss. Enjoy your stay with friendly hosts at the Lobster Motel in one of the 25 large motel rooms. There are 14 rooms with Queen Beds, 11 rooms with a Queen and single bed and six of these rooms are interconnecting so you can fit the entire family, including Grandma. Click here to see our facilities. All rooms feature FREE WiFi, dual entrances, reverse cycle air conditioning, en suite bathroom, TV, Fridge and there are common laundry facilities. The Lobster Motel is situated on large, spacious grounds, with plenty of parking for trailers, trucks and caravans, making it ideal for business travellers and holiday makers alike. Take a relaxing dip in the Lobster Motel’s crystal clear swimming pool, cook up the days catch or some prime local produce on the BBQ facilities or just relax in the spacious sun room. The choice is yours. We have a delightful restaurant on site, which will be reopened after the upgrade is complete. In the meantime. 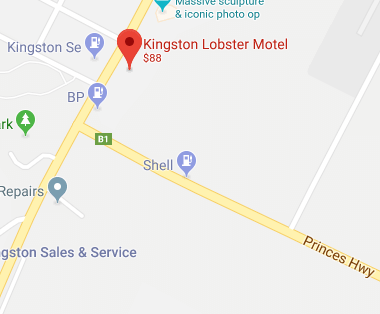 If you wish to sample some of Kingston’s excellent dining facilities, there are 4 locations within a leisurely 150 metre walk of the Motel, including the Big Lobster Restaurant. The Lobster Motel is rated 3 stars, making it excellent value for the budget conscious traveller and you won’t find a better room rate along the coast. Discounts are available for stays greater than 3 nights. Want to know the local's secrets? Ask your friendly hosts for comprehensive information on the sites and features of Kingston. Rooms start at $95/night per double during the off season (Apr to Aug, excluding Public and School Holidays) and $99/night per double (Sept - Mar). Extra person is just $15. The Kingston Lobster Motel may well be the best value for money on the Great Ocean Road.